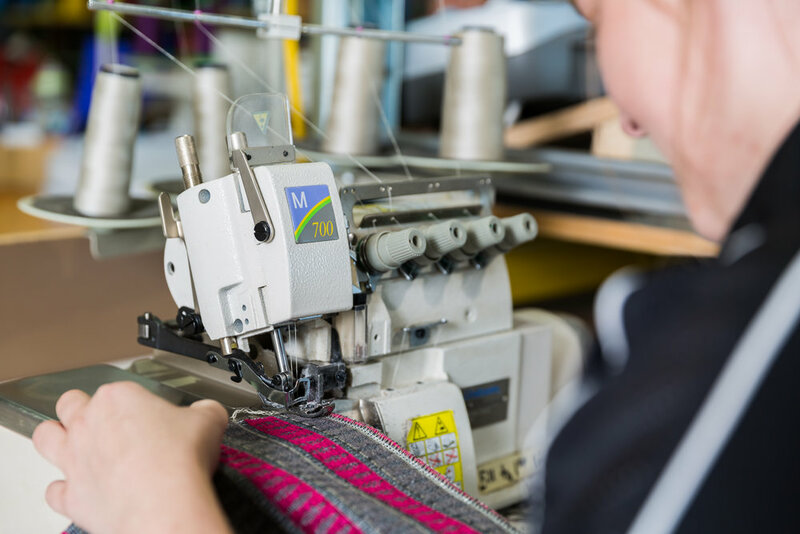 Based in Hawke's Bay's industrial and commercial zone in Onekawa, Napier, Regal Furniture was established in 1985 and is a market leader of commercial, upholstered seated furniture in New Zealand. 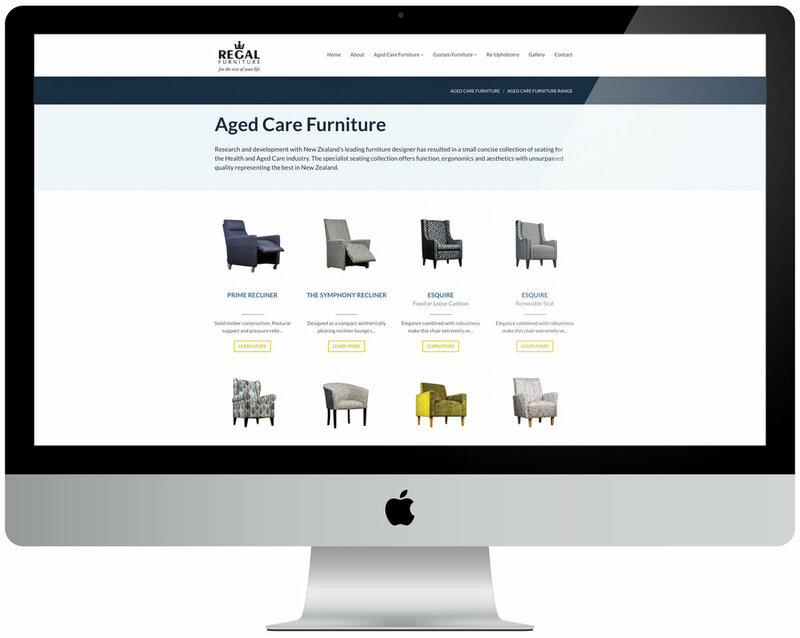 The Regal team work closely with interior designers, architects, builders, joiners and construction companies, to manufacture and supply soft-seated furniture across New Zealand, primarily in the hospitality and aged care sectors. Emma Robertson, owner at Regal Furniture, also works closely with Simon Cartwright from SCP Photography. 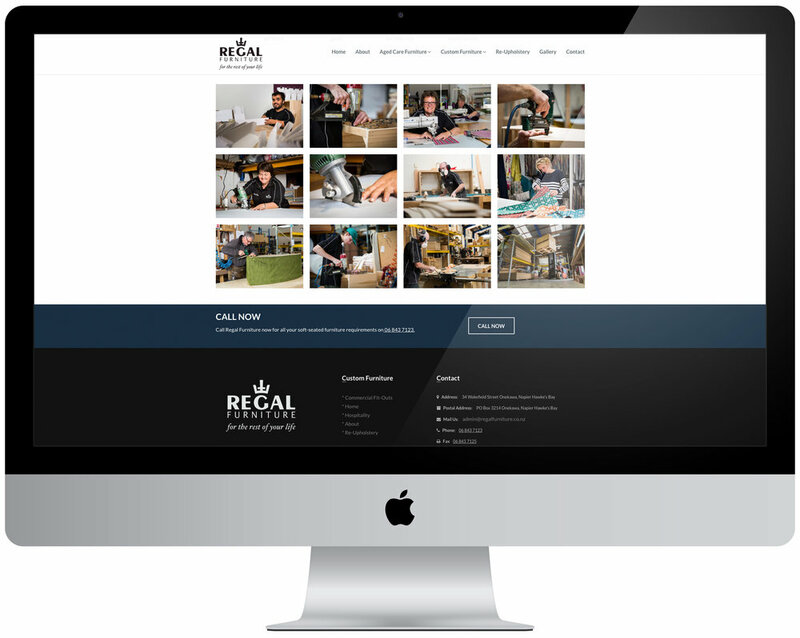 In 2016, alongside Webfox who were designing and developing a new website for Regal Furniture, SCP was initially contracted to shoot images of Regal's staff and product lines for the new site. Since 2016 SCP has returned to Regal multiple times, often on-demand and with tight timeframes, to capture newly designed and built furniture as it's finished and taken to market. "Simon from SCP has been really accommodating. Production of new product lines often goes down to the wire. So we need him to turn up at the drop of a hat and take photos of our new products for tight print deadlines. Simon does this with enthusiasm, efficiency, and without any stress or hassle at all. He just gets what we do." 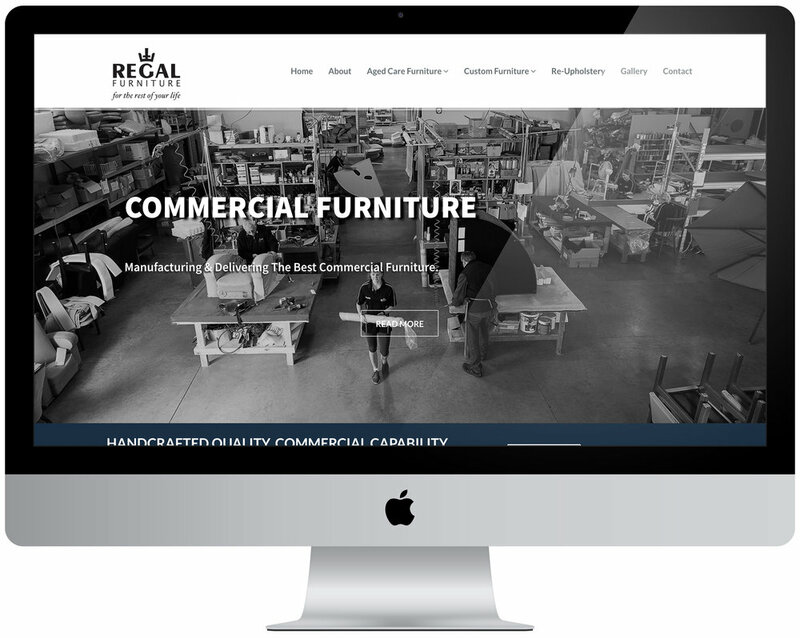 To date, all imagery has been shot at Regal Furniture's factory in Onekawa, Napier. This is a large open-plan space with an abundance of equipment and materials, and over 20 staff working on products, making it a very busy environment. With the photography for the new website, SCP shot staff working in various areas of the factory carrying out their day-to-day tasks. Natural, ambient and artificial lighting introduced by SCP was used in combination to light subjects accordingly. For the initial and ongoing product photography, SCP sets up an impromptu studio in the factory. This set-up includes a light coloured floor and an existing white wall used as a backdrop. Products are then lit and shot 'isolated' to eventually be clear-cut for use on Regal's website and in print collateral. "Simon brings his own lighting and sets up the impromptu studio in the factory each time. It's quite innovative and it does the job really well. Products shot on many different occasions all look like they're from the same photo shoot, which is exactly what we're after." "Photographed over the course of a full day, we started bright and early to capture staff as a group before the day’s work began. We then photographed them working in and around the factory before going on to shoot Regal's product lines. To maintain consistency for the product shots, we marked the position of each piece of the furniture on the floor using tape. This meant we could position subsequent pieces of furniture in the same position and angle, only having to alter the camera height on the tripod to suit the piece being photographed." An example of on-demand photography SCP delivers is for Regal's product brochures, which are updated as and when new products are developed and finished. These brochures are then provided to existing and potential clients so they can view products on offer and ultimately place an order. "I think everything works well because Simon and I have tight communication. A few weeks out from finishing a product or new line I give Simon a heads up. We then stay in touch not knowing exactly what day we'll be ready for him to turn up. But when the time comes, he's here and ready to roll. He's never let us down." Another example of a tight turnaround was when the then Prime Minister Bill English visited Regal's factory to unveil a new product. Such visits by government ministers have short notifications but Simon was called and able to turn up immediately. "Another time Simon came through for us was when Prime Minister Bill English was due to visit and launch a new recliner chair. This product's development was partially funded by the Callaghan Innovation, so its unveiling was a pretty big deal. Once again, Simon turned up to capture the moment brilliantly." As with many business's product photography, colour accuracy is key. With Regal Furniture's product imagery what appears online or in print is how clients choose new furniture to purchase. Therefore, SCP uses a foolproof tool to achieve this. The X-rite ColorChecker system and calibration software ensures the correct colours are captured on camera and carried through to post processing, then ultimately reproduced online or in print as they appear to the naked eye. Using advanced profiling technology, ColorChecker delivers excellent results in difficult or unusual lighting conditions. A 'Passport Target' is shot in the same lighting as the images then used as a visual reference to assist with colour correction in post production and in turn, reproduction digitally or in print. Simon from SCP Photography delivers photography for Regal Furniture that is tailored to suit their unique requirements and the expectations of their target audiences. With energy, efficiency and innovation, SCP accurately captures the way Regal work, the environment they work in, and most importantly of all, the high-end commercial furniture they produce. For product images, SCP typically uses a shutter speed of around 1/160 sec to underexpose ambient light within the factory and to ensure there are no mixed light sources. Products are then lit with Godox strobes / soft-boxes and calibrated white balance using X-Rite ColorChecker. Using the 100mm Macro lens, aperture settings are typically around f22 to maintain a wide depth of field and ensure products are sharp and in focus from the front to the rear. For the website photography the camera settings varied for each image as the ambient light levels within the factory changed in each location. Where additional lighting was required, we used Godox strobes and soft-boxes, or bounced light off the factory roof or walls to boost ambient levels. *All quotes in this article compliments of Emma Robertson, Owner at Regal Furniture.